How sweet! Hello Kitty celebrating the miracle of life! Do you know if this is professionally made? If so you can submit it to cakewrecks.blogspot.com and spread the pain around. 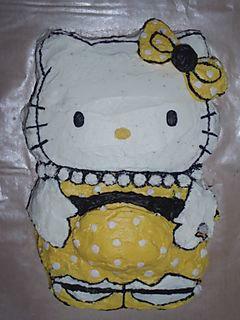 Hello Kitty got knocked up and ate waaay too many Hello Kitty Not Pregnant Cakes… ew! Really, now, what kind of message does that send? Is she even married? Good awful, what are they trying to say: Hello Cesarean section or Hello Abortion. I send my condolences in your direction. So do you cut her belly open and Satan jumps out? who did she do it with huh??? Considering that Hello Kitty is supposed to be a third grader, this is beyond disturbing. SCREW ALL YOU HELLO KITTY HATERS!!!!!!!!!!!!!!!!!!! Looks like Kitty’s twin sister Mimi to me? Perhaps “Robert” forgot to wear his Hello Kitty brand condom? Maybe this is supposed to be Kitty’s mom? I think she wore pearls… I wonder what Grandma will say! Clearly Hello Kitty and Dear Daniel had carnal relations. Unless of course she had inter-species relations with Tuxedo Sam, Badtz Maru or perhaps Keroppi? This cake would be great at a baby shower. I was told that Hello Kitty had blue waffles(google image it. I dare you.) You can bet she isn’t married.